A preferred bidder has been selected for an Aberdeen paper mill which employs hundreds of people, BBC Scotland has learned. 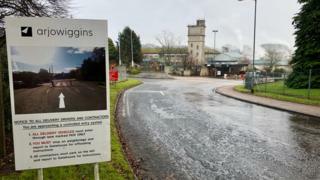 The future for nearly 500 workers at the Arjowiggins Stoneywood plant was plunged into doubt in January after its parent company failed to sell it. The proposed deal is for the sale of the assets of the business as a going concern and the retention of all staff. There are currently 482 staff at the Stoneywood site. A spokesman for the administrators FRP Advisory said: "The joint administrators have selected a preferred bidder for Arjowiggins Fine Papers Limited operations at Stoneywood in Aberdeen and in Basingstoke, and Arjowiggins Chartham Limited in Chartham, Kent. "The proposed deal is for the sale of the assets of the business as a going-concern, and the retention of all remaining staff, who currently number Stoneywood (482), Basingstoke (28) and Chartham (86). "Subject to the satisfactory conclusion of due diligence, it is hoped that the deal will conclude around the middle of April." Tommy Campbell, from the Unite union, said: "This is very welcome news and another step in the right direction towards securing the long-term future for all the jobs at the paper mill. "The workforce and their families will be glad to hear that a buyer has been agreed and we now await the final news in a few weeks' time that all the jobs are safe and that the mill definitely has a long-term future."